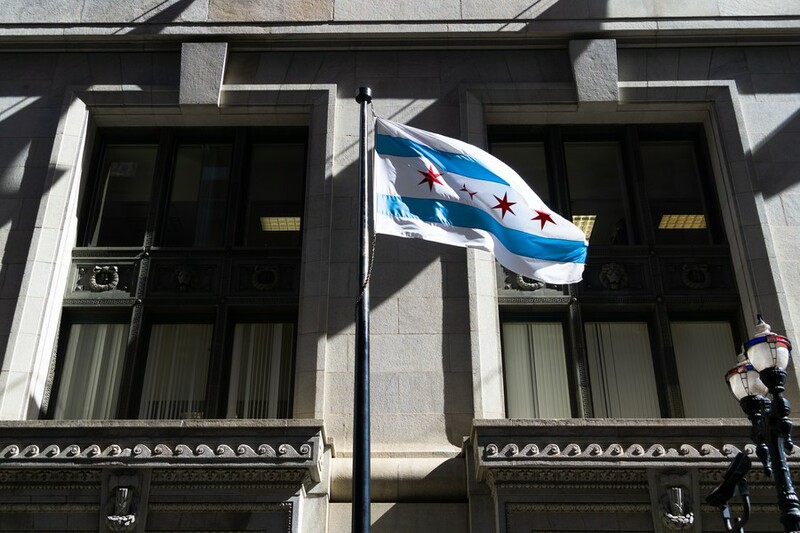 Chicago held runoff elections earlier this month after many races in February’s general election ended with no candidate receiving more than a half of the votes. These include the mayoral race and the treasurer’s race as well as some races closer to Hyde Park, like those for aldermen of the Fifth and 20th Wards. Read on to find out how the neighborhood voted in these hotly-contested elections. The below maps were created by South Side civic journalism organization City Bureau. In a historic mayoral race, former chair of the Chicago Police Board and Police Accountability Task Force Lori Lightfoot (J.D. ’89) defeated Cook County Board President Toni Preckwinkle (A.B. ’69, A.M. ’77). It was the first time that two African-American women were on the ballot for the office. Lightfoot won the runoff election with 74 percent of the vote. The breakdown of votes in the runoff varied greatly from the breakdown in the February general election. Lightfoot led the general election with 18 percent of the vote in a crowded field of 14 candidates, and she carried 11 wards all on the city’s north side. Preckwinkle followed closely behind with 16 percent of the vote and won clear majorities in six wards, including the Fourth and Fifth wards. In the runoff, Lightfoot saw a sweeping victory, picking up majorities in all 50 wards, including ones Preckwinkle had carried in the general election. Lightfoot was able to gain the support of the Northwest and Southwest sides of the city, which had been carried by Jerry Joyce in the general. Joyce, alongside Jesus “Chuy” Garcia gave key endorsements for Lightfoot. Although Preckwinkle hoped to find support in wards that Bill Daley carried in the general election with backing from other members of the Daley family, such as Cook County Commissioner John Daley and 11th Ward Ald. Patrick Daley Thompson, Lightfoot ultimately lagged in only 20 precincts city-wide. Hyde Park area races were more closely divided between Preckwinkle and Lightfoot than those in other parts of the city, with Preckwinkle finding support in UChicago-dominated areas and the surrounding wards. Lightfoot took 66 percent of the vote in the 20th Ward and 54 percent of the vote in the Fifth Ward. Lightfoot also took 60 percent of the vote in the Fourth Ward, where Preckwinkle was formerly alderman. Besides Precinct 2 in the 11th Ward, all the precincts that Preckwinkle carried in the runoff were within the Hyde Park area. The majority of support for Preckwinkle came from 11 of the Fifth Ward’s 41 precincts. This area includes Precinct 27, which contains most of the University of Chicago campus. Preckwinkle also took 50 percent of the vote in the 20th Ward’s 34th Precinct, which includes the University’s southernmost residence halls. Voter turnout for the mayoral runoff was 35 percent, slightly higher than the near historic low of 33 percent in the general election. The Fifth Ward aldermanic race is still too close to call a winner. Incumbent Leslie Hairston is in the lead at 50.64 percent, but only 174 votes separate her from her challenger, activist William Calloway. Calloway has not yet conceded. Some mail-in and provisional ballots are still waiting to be counted and the Calloway campaign is waiting for those results before conceding or asking for a recount. These ballots must be counted within two weeks of the election, which could delay the results of the race until April 16. The results are fairly close in nearly every precinct. The only precinct to give one candidate more than 65 percent of the vote is Precinct 7, where Hairston took 65.6 percent of the vote. According to current tallies, Hairston took most of the ward’s northern precincts, including Hyde Park, while Calloway took most of the southern precincts in neighborhoods like South Shore and Greater Grand Crossing, which are largely African-American and low-income communities. In February’s general election, third-place finisher Gabriel Piemonte carried many precincts on and around the University’s campus, including Precincts 8, 19, 27, and 34. 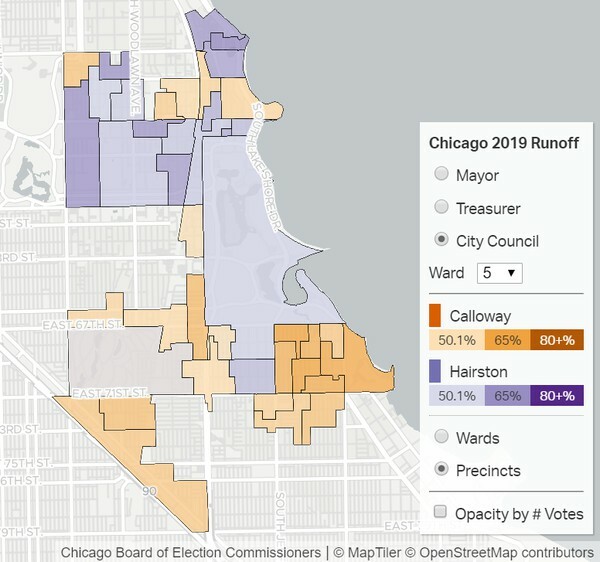 Although Piemonte has endorsed Calloway, Calloway is currently behind Hairston in all precincts that went to Piemonte except for the 19th, which Piemonte did not anticipate on election night. Calloway did pick up many precincts he failed to carry in February. While most of his support in the general election came from a cluster of precincts southeast of Jackson Park in South Shore, he managed to flip all precincts in the southern part of the ward except for Precincts 25, 28, and 30. He also gained a lead in some northern precincts like the Fourth, 18th, 23rd, and 24th, which went to Hairston in February. Turnout for the runoff was 42.4 percent compared to 42 percent in February. Community organizer Jeanette Taylor won the 20th Ward aldermanic runoff with 60 percent of the vote, defeating nonprofit worker and former teacher Nicole Johnson. Taylor carried 32 of the ward’s 39 precincts, with her strongest support coming from Woodlawn. Precinct 34, which covers the southern part of the University campus, voted for Taylor by a margin of 36 percent. Johnson’s strongest performance came from Back of the Yards and in her home neighborhood of Englewood. Despite Johnson’s strength in the area, Taylor won seven precincts which had belonged to Johnson in the general election: two in Washington Park, one in Back of the Yards, and four in Englewood. Johnson was able to flip only Precinct 21, located in Back of the Yards. In the general election, which fielded nine candidates, Taylor and Johnson took 29 percent and 22 percent of the vote, respectively. Taylor won 21 precincts to Johnson’s 11. Most of the candidates who did not advance to the runoff threw their support behind Taylor, potentially contributing to her success in consolidating support. Taylor received on-campus support from UChicago Student Action (UCSA). Activists participated in phone banking, neighborhood canvassing, and on-campus initiatives. Third year Julia Attie, a member of UCSA’s core team and co-chair of its Fair Budget UChicago Campaign, cited Taylor’s past alignment with the group’s agenda, specifically her support for the successful trauma center campaign, as a source of enthusiasm. “We were very excited to throw down on the 20th Ward election—especially since Jeanette has worked on the campaigns UCSA has historically worked on,” she said. Attie added that Taylor’s victory encourages progressive activism on campus. She told The Maroon that UCSA hopes to work with Taylor’s office in the future, including on plans to get the city of Chicago to establish an environmental justice agency. “Strong relationships with aldermen like Jeanette are integral for making that happen,” she said. Voter turnout for the runoff election was 29 percent in the 20th Ward, down from 34 percent in the general election, a figure which was itself a near historic low. Melissa Conyears-Ervin, a former member of the Illinois House of Representatives, defeated outgoing 47th Ward alderman and University alumnus Ameya Pawar (S.M. ’09), with 60 percent of the vote to Pawar’s 40 percent. Although Conyears-Ervin carried 65 percent of the vote in the Fifth Ward, Pawar actually won a 72 percent majority in the ward’s 27th Precinct, which contains the southern section of Hyde Park and most of the University’s campus. Pawar served as a residential fellow at the University’s Institute of Politics during the fall of 2018, which may have given him familiarity with residents local to the University. Similarly, although Conyears-Ervin won 79 percent of the vote in the 20th Ward, she gathered just 58 percent in that ward’s 34th Precinct, which contains the University’s southern dorms and dining hall. For Conyears-Ervin, the margin of victory in that precinct was significantly closer than that of all adjacent Woodlawn precincts. Overall, Conyears-Ervin received overwhelming support throughout the West and South sides, while Pawar carried much of the North Side, receiving 77 percent of the vote in the 47th Ward, which he has represented since 2011. Conyears-Ervin previously worked for Breakthrough Urban Ministries, a charity organization local to Garfield Park and the West Side. Pawar, meanwhile, has led and contributed to several initiatives local to the 47th Ward, including GROW47, which connects elementary schools in the 47th Ward to local high schools in order to create a consolidated neighborhood school community. During the general election, the margin between Conyears-Ervin and Pawar was significantly closer, with the two earning 44.3 percent and 41.6 percent of the vote. After a surprising rise in a crowded mayoral field, Lightfoot promises accountability to Chicagoans.